In the last few months, the WMJobs team have attended various events to ensure we are bringing you the latest resourcing trends and technologies. Here, we have compiled the key elements of each event to give you some food for thought and offer solutions, where possible, to any key questions posed. On the 8 October West Midlands Childrens Services hosted their Agency Showcase Event in Birmingham. The event was attended by a mixture of HR, Children’s Services and Procurement colleagues from each of the 14 local authorities who provide social care to young people. A selection of employment agencies, who recruit into the sector, were then able to present their proposals to supply permanent social work staff into the region and fill the considerable permanent vacancies that exist regionally. The agencies were also asked to minimise the extent of movement of workers from one authority to another within the region in their proposals, not “robbing Peter to pay Paul” -as mentioned a few times during the day. Added to this we can see that around 55% of users of wmjobs.co.uk are looking at jobs on a mobile device. Its worth considering this when thinking about the content of the application you choose, can this be reduced, or document uploads used perhaps? Many agencies pinpointed specifically that time taken to gather in clearances post offer is often the point at which candidates can be enticed or lost elsewhere. The swift collection of references and registrations therefore becomes a necessity. It can be an onerous task chasing down referees, but nonetheless incredibly important to retain your new hire. All the agencies will happily do this for recruiting organisations (at a cost) but it is worthwhile considering if internal processes could prioritise or automate this? Almost all agencies provided video interviewing or screening facilities, describing this as an almost essential requirement when recruiting from outside the region or abroad. The event provided a lot of information on recruiting from overseas as well as the various recruitment methodologies available. The Future Social process will now move on to look at possible shared provisions or partnering. An interesting day to kick off what we hope will be a beneficial programme to address social care recruitment challenges we face as a sector. Taking a pure system focused approach to the above question we would recommend you consider the following areas which may help answer the above. Can your applicants complete your application in 15 minutes or less? Can you speed up the process to hire within your existing toolkit? Can you use video technology to pre-screen and interview? Can you use text messaging in your processes? Are bespoke, shorter applications used specifically for social care vacancies? In September Chris and Nicola attended the In-House Recruitment Live event to hear from guest speakers from a variety of recruiting backgrounds, as well as a multitude of companies offering their goods or services to get up to date on the latest in resourcing. “‘Data driven recruitment’ – we are all aware that data we collect through HR technology and systems such as TalentLink is valuable and is worth analysing to inform recruitment strategies and really know that what is being done is working. Not knowing what the reasons are for not finding, attracting and hiring the right people makes it impossible to fix and improve the process. “From a candidate experience point of view, it made me wonder: how many of us are asking our candidates about their experience of our recruitment and selection processes? Are we measuring the effectiveness of our processes from both a candidate and manger perspective? Ultimately, these users are at the heart of these processes, so it makes sense to get input and feedback straight from the source. “There is a key theme within recruitment and resourcing that is being re-iterated across the events we are attending. Where it used to be a recruiter’s market, stick a job advert out there and lots of good quality candidates will apply, it is now a candidate’s market. Following on from the above, last month Illesse and Chris travelled down to London to represent WMJobs at the Madgex Labs Live event (our WMJobs platform provider). Here are some key themes that stood out them. “One aspect of the day which resonated with me was the job seeker survey. “It’s interesting getting insight into the thought process of jobseekers, and I was shocked to learn that nearly 50% of those surveyed will change jobs in less than a year, with most only applying for two to three vacancies. “So, one thing that myself and Chris discussed on the day was how we can ensure the right roles are being seen by the right people. Are the people viewing your vacancies quality candidates, not just quantitative? Is enough being done to measure and report on this? A review of where your candidates are being sourced from and how successful they are in the recruitment stages will help inform the above. “Likewise, it demonstrated the need for greater employer branding as recruiters are competing in the same pool for talent. It’s worth considering the messages that are being put out, not just in the job advert but also as a brand. For example, is your recruiter page up to date with the benefits of joining your organisation? Is there anything more you could be doing to entice candidates into working with you? Who would be your role model organisations that do this well? If you consider that there have been reports that the jobs board has been dying for the last 10-15 years, despite changes in the industry and the ways that we now need to engage with different groups of candidates, the fact remains though that the jobs board is alive and well! 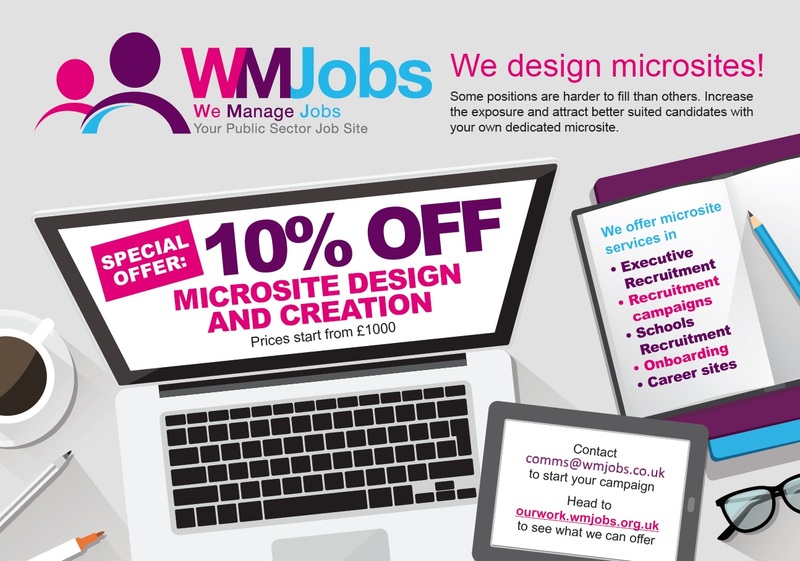 Think about WMJobs; With its unique public sector focus enabling candidates across the region to find jobs and apply, the site isn’t just doing well, but is also well placed to continue to grow and embrace future changes that take place within the recruitment industry! AI of course is one of these changes, two words as exciting to some as it is nerve wracking to others. AI isn’t coming – it is already here. In fact, it’s all around us; I’m sure you’re all familiar or have heard of Alexa, Siri or Cortana for example? AI is something we don’t have to fear. An artificial being like the Terminator is not going to hunt us all down. How many times have you asked Siri or Alexa a question and been met with the wrong response? The fact is that the technology isn’t sophisticated enough; it needs us to provide it with data, questions and answers so it can know how to respond in a scenario. In other words, we need to teach it to do what we want, we can’t just wave a wand and it will do what we need. So, we will see AI in the recruitment industry and it will aid us all in our bid to recruit the best people into the right role – watch this space in the future to see how. If you would like to further explore any of the topics mentioned above, please feel free to contact the team. Next Post: Health checks: no thermometers, but a great way to share best practice and gauge performance!